During this holiday season, The Deck and Patio Company thought we would share one of our favorite projects for everyone to enjoy. The clients wanted a good deal more than an outdoor pool and patio; they wanted a wide range of resort-style amenities to enhance their already existing majestic views of Long Island Sound. 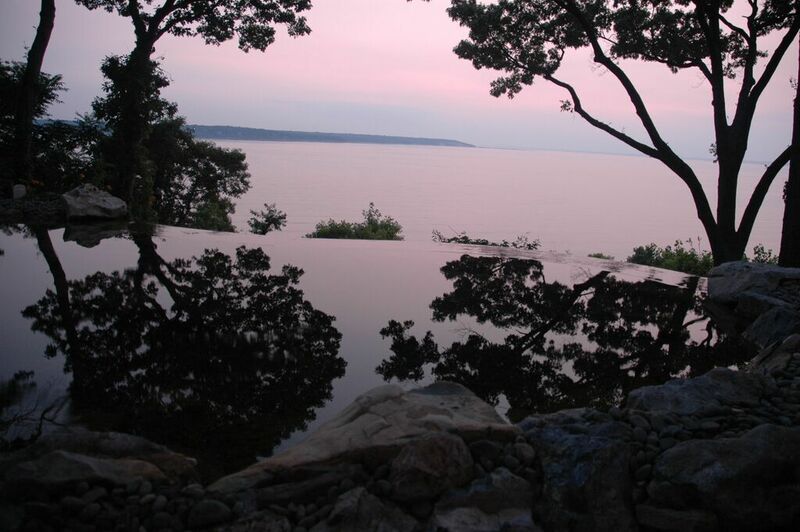 One such amenity was a vanishing edge, or “infinity” pool that brings the view of the shoreline right up to their backyard patio. In addition, we included a spectacular custom spa, also perfectly positioned to enjoy the “vanishing edge” from it as well. 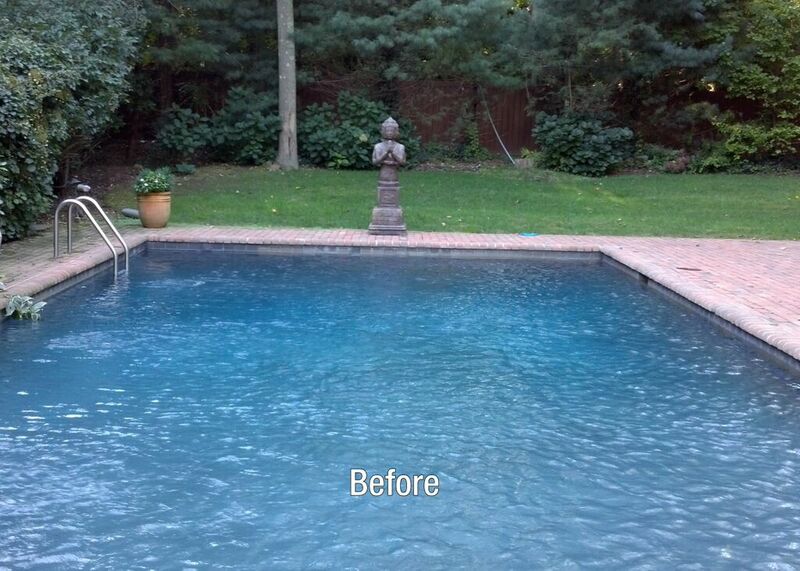 Another main request from the clients was that we restore and update the site’s existing pond. We gave it a face-lift and expanded it to include a waterfall, bridge, moss rock cave, a Savio skimmer and Aquascape biofalls. The entire project includes the vanishing edge pool with five water pumps, 3,000 square feet of tumbled stone patio, two natural gas campfires, and large evergreen trees that flank the left and right side for privacy. 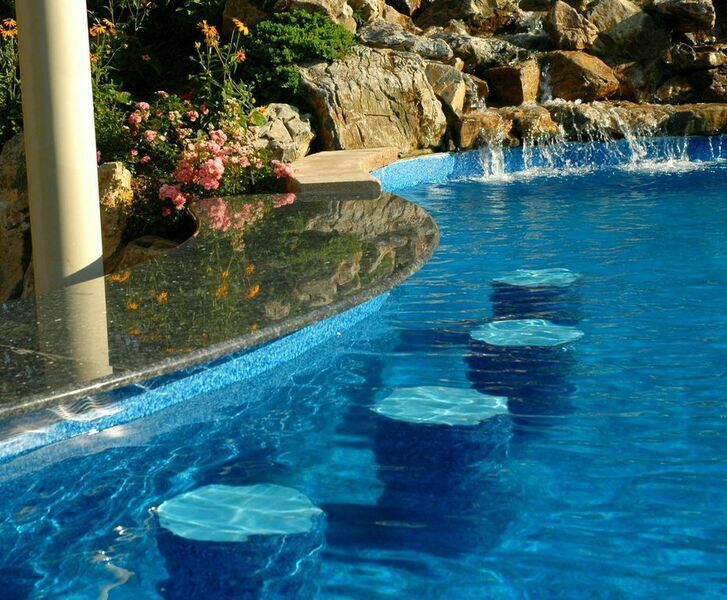 In the pool, there are two waterfalls, five bar stools, three staircases, and in-floor cleaning. 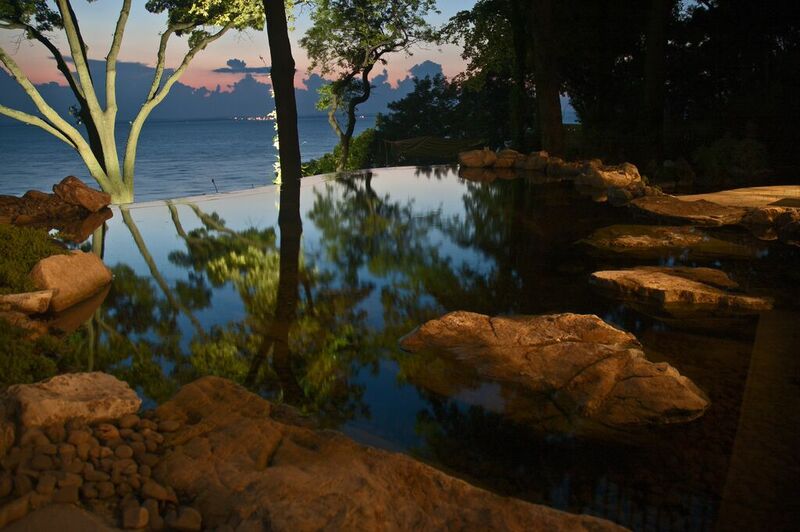 To enhance an already beautiful view of Long Island Sound, the owners of this waterside home wanted an infinity pool; a spectacular “infinity” spa also became part of the project. A swim-up U-shaped bar also serves as a patio bar; the pool boasts 5 in-pool stools and swim-out steps. 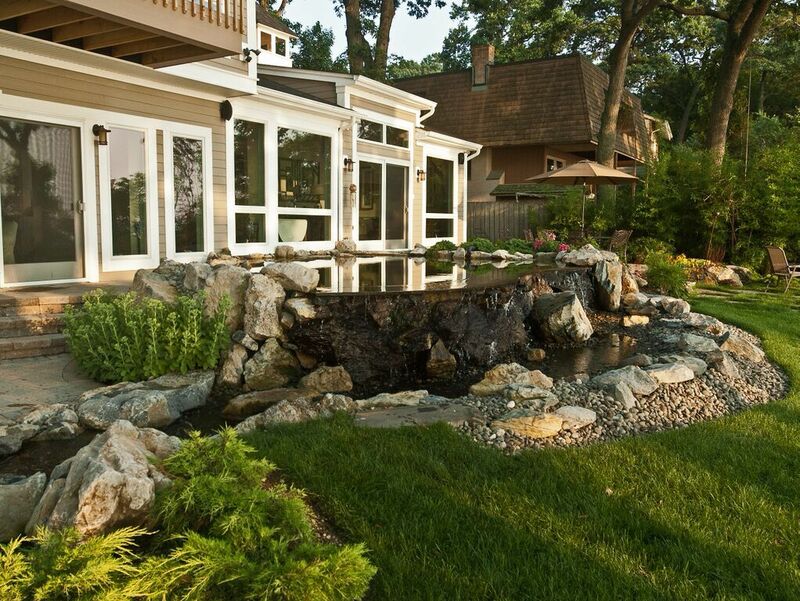 Deck and Patio’s outdoor living expert and his team restored and expanded the existing pond to include a waterfall, bridge, moss rock cave, a Savio skimmer and Aquascape biofalls. Lighting the pond creates an exquisite scene at night. The ultimate in resort-style living includes vanishing pool, custom spa, tumbled stone patio, natural gas campfires, evergreen trees for privacy, pool waterfalls, in-pool bar stools, three staircases, and in-floor cleaning. Happy Holidays: May the joys of the season be with everyone! Deck and Patio’s outdoor living expert finds that backyard natural retreats — once championed for their “staycation” potential — are becoming more and more popular for short daily escapes. Indeed, quiet moments listening to the trickle of water as birds sing offer ongoing opportunities to disconnect from technology, so sorely needed in today’s modern life. However, many do not realize that these daily escapes can be equally enjoyable in winter! 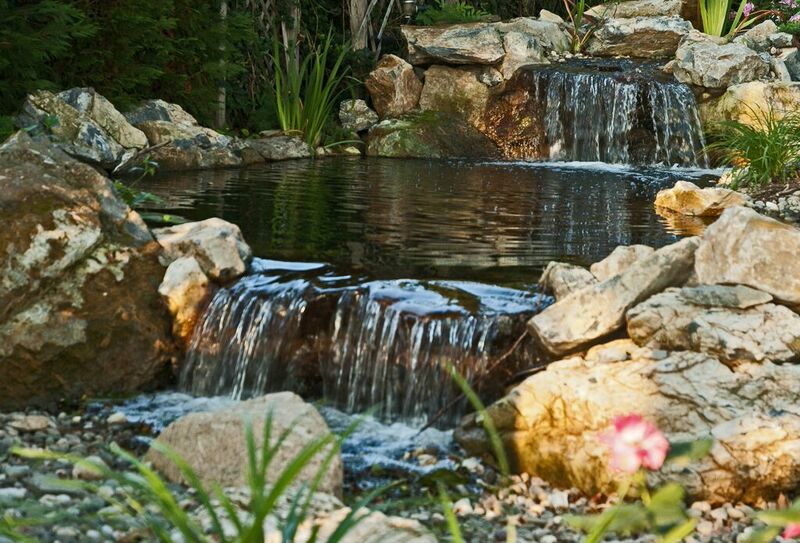 If you add a backyard koi pond as part of your retreat, it no doubt will include a small cave where the koi can lay dormant during winter months. However, that does not mean you need to hide in your indoor home-cave. By including an in-ground or above-ground spa in your backyard oasis, a bubbling, steaming spa will be waiting every day to warm your cold bones, rejuvenate, and supply the ideal spot to watch and listen to winter birds at their feeders — a true winter wonderland! 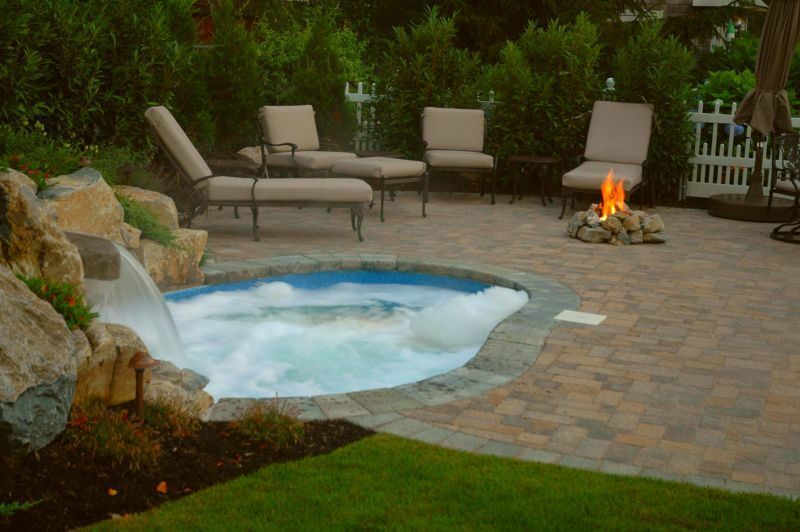 By including an in-ground or above-ground spa in your backyard oasis, a bubbling, steaming hot tub will be waiting every day to warm your cold bones, rejuvenate, and supply an ideal spot to hear the winter birds sing from their feeders. 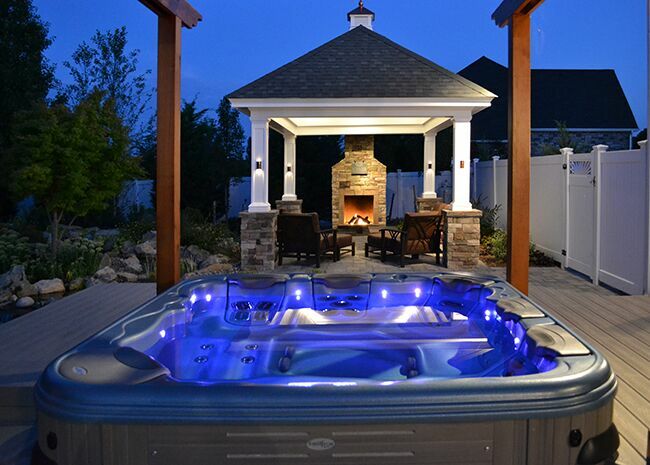 Imagine a beautiful outdoor retreat with rushing waterfalls that frequently glistens with ice crystals as the cold months settle in. Also, picture the extraordinary sunsets and starry nights that shine through winter’s crisp, clear air — made all the more splendid by a vanishing edge, or “infinity” pool or pond, bringing vistas right up to your backdoor. 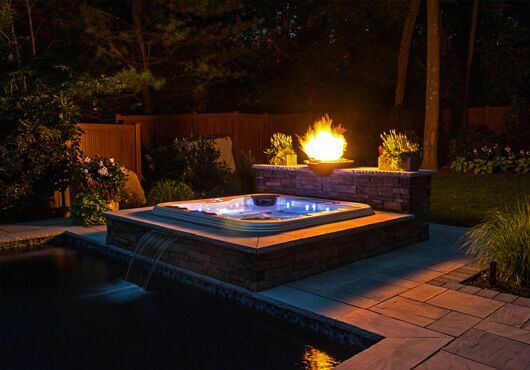 The clear, crisp winter air makes for extraordinary sunsets and starry nights — made all the more splendid with a vanishing edge pool or pond. Under the stillness of one of our large multi-faceted water features (vanishing edge upper pond and lower pond, waterfalls, and a gentle stream) Deck and Patio’s outdoor living expert installed an extremely high tech and a complex natural biological filtration system that continuously maintains the feature’s crystal clear water. 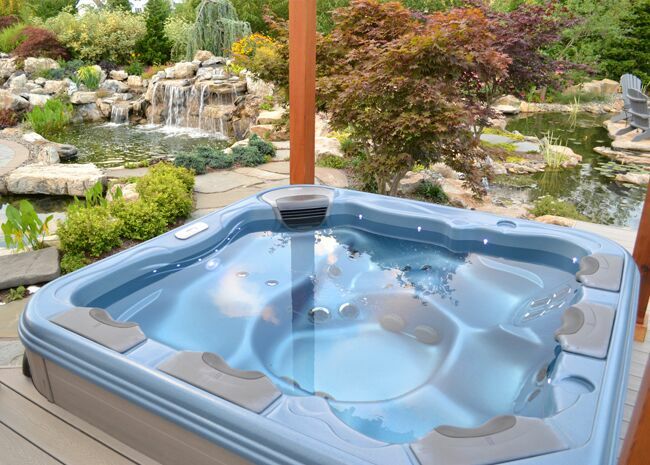 An extremely high tech and complex natural biological filtration system maintains this feature’s crystal clear water. This water feature project includes three bodies of water: two ponds at two levels, and a 3,000-gallon underground storage vault of water – all kept clear and clean with “biological filtration” through the use of beneficial bacteria, plants and other filter media. The vanishing edge upper pond is raised in front of a bluff. Water spills from it into a delightful connecting meandering stream down to the lower pond located at the side of the house. Water is pumped from the underground vault to both ponds through variable energy efficient speed pumps. In the upper pond, water enters from its floor. In the lower, it enters through a separate bog – a natural filtering system – and continues through a waterfall into that pond. Except for what is pumped in from below, everything works through gravity along gradations that our team created in the landscape. 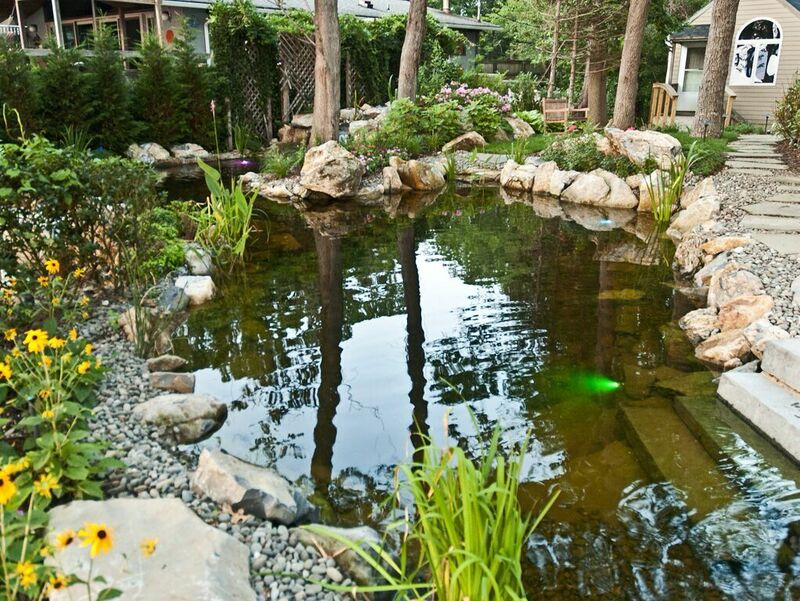 Every part of the water feature has a reason and purpose and works together in an ecologically friendly way. Every part of this water feature (summer view) has a reason and purpose and works together in an ecologically friendly way. Thanks to a revolutionary design from Aquascape Inc., today you can combine a recirculating decorative water feature (humble or grand) with a sub-surface rainwater harvesting collection system. This collected water can be used at your residence and/or business for jobs that don’t require treated water: washing vehicles, watering a lawn, spraying down a deck, or nourishing a garden. The Deck and Patio Company — through its Rainwater Harvesting Group — specializes in these Aquascape’s RainXchange systems. Recently, we’ve been at work in Brooklyn, New York, where a very tight city backyard is barely 25’x 12’. Renter adds that rainwater harvesting also reduces energy and water bills, sometimes by as much as 40%. LEED points can accrue from reducing municipal water requirements, by using locally-sourced materials that reduce transportation costs, and from reusing old bricks or materials, etc. 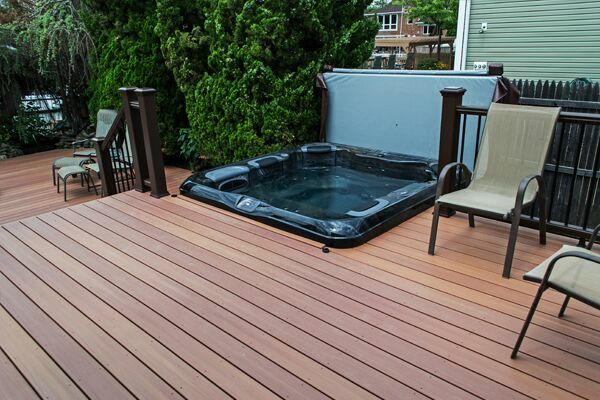 The following photos and video show The Deck and Patio Company hard at work at this Brooklyn project; we’ve also included two photos that showcase how beautiful a completed water harvesting job can look. In addition to the the RainXchange system, these clients wanted a small built-in barbecue; they have a vegetable garden and we planted drought-tolerant xeriscape plants across from it. 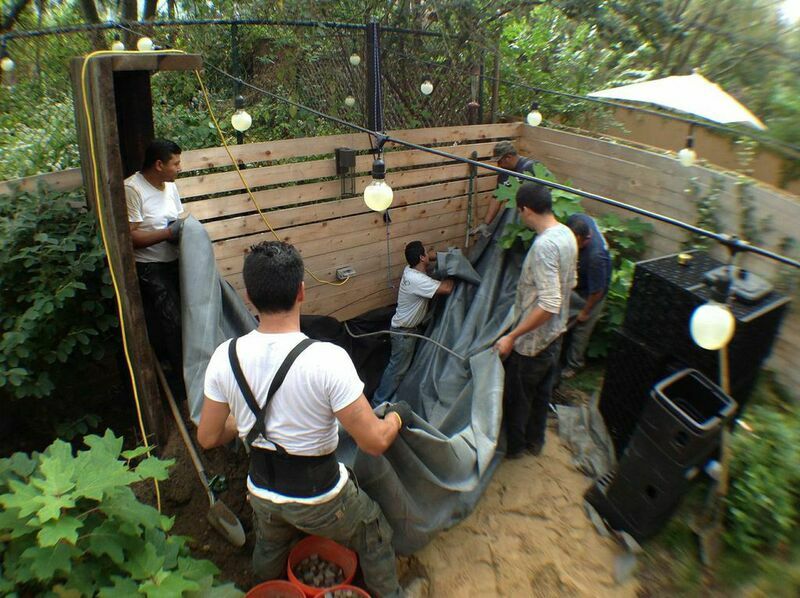 Water will come off their Brooklyn 4-story roof and collect in a 500-gallon underground rainwater harvesting reservoir. When it’s full, water flows into an overflow regeneration zone where it can perk slowly back into the ground. Previously, any excess water from rainfalls etc. ran off into the New York City sewer system; now, because rain water and any overflow will be collected, stored, and controlled, the water for plants and vegetables is completely disconnected from the city sewer system. We had to dig a hole 4’ x 6’ and 3’ deep to install the underground 500-gallon reservoir. This required digging out soil and filling 5-gallon buckets that our team carried one at a time down to the basement, up stairs, and out to a dump truck in front of the house. We used all Aquascape Inc. products, e.g: an underlayment to absorb roughness and prevent rocks and roots from puncturing equipment; AquaBlox (plastic matrix modular system for water storage and filtration), submersible pump to operate the water feature (bubbling rock) rock, etc. We drilled a hole through a rock to create a bubbling rock feature; water bubbles up and then goes back down; having a connecting water feature allows the water to be continually aerated, thereby helping to purify the water. The “pondless” waterfall we installed some time ago for these clients collects the waterfall’s falling water in an underground tank with a pump that circulates and helps keep the water for this feature pure. This more ambitious water feature by Deck and Patio includes a stream, and multiple waterfalls — all recirculated through the same RainXchange water collection system. City water is not used. When creating this beautiful backyard retreat, the first challenge facing Deck and Patio Company’s Outdoor Living Expert, Bill Renter, was meeting the expectations of both the husband and wife: he wanted a place to take full advantage of the sun; she wanted a cool place to relax with friends. The solution was (1) to position the pool in the sun, in order to gain the most sun exposure during the day and, (2) for congregating in comfort, create a shady pergola, over a granite swim-up/walk-up bar and patio. The second challenge was ensuring the plan would fit in the 12-foot elevation change from the rear of the home to the back of the property. 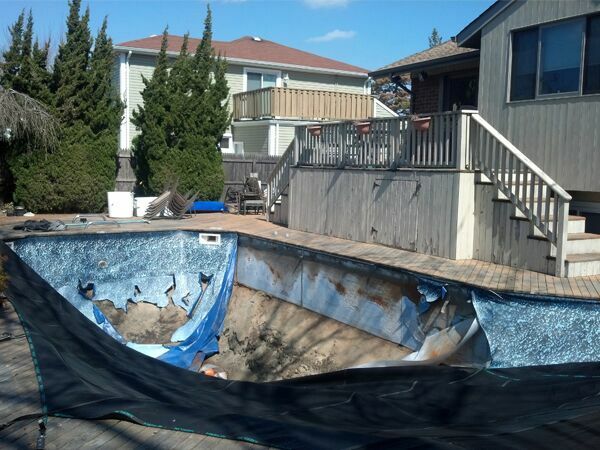 To alleviate this problem, we built a multi-tiered Techo-Bloc system of patios, including a raised patio, with a wide, wrap-around stair, leading to the pool, lower patio, and a sunken swim-up-bar patio. We did all this without using rails and fences, which would obstruct views of the natural stone waterfall and vibrant landscaping. By designing wide stairs, multi-level stone walls and generous planting beds, we were able to create a colorful buffer between the upper and lower levels. Both husband and wife were delighted with the design, and the property’s most difficult challenge — its rising elevation — was turned into a benefit. This project won several awards, including the prestigious Gold prize from the National Spa and Pool Institute (NSPI). 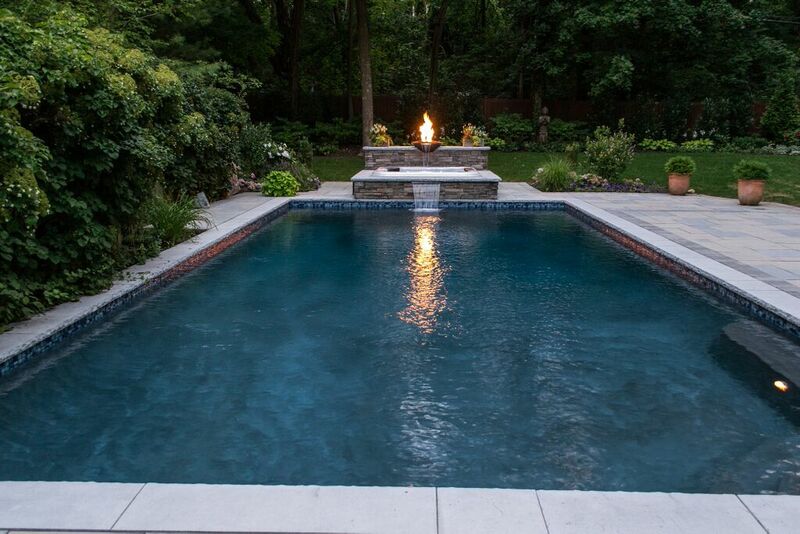 Matching steps, walls, coping and moss rock add elegant finishing touches to the Techo-Bloc patios that surround this inviting free-form vinyl pool. 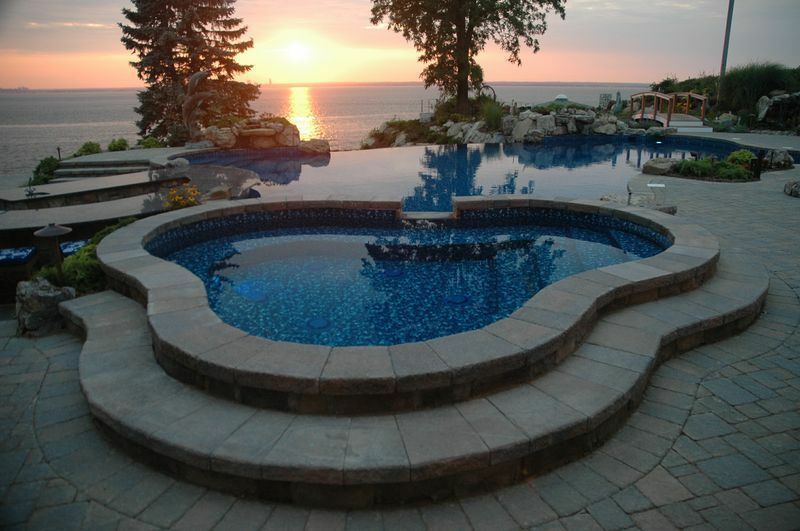 This 32-foot, U-shaped swim-up granite-topped bar, in cultured stone and rock facing, curves around to be enjoyed from patio as well. Techo-Bloc’s Elena/Sandlewood, with its warm gray and tan earth tones, in random sizes, creates welcoming spacious patios around new free-form vinyl pool. For the ultimate in outdoor socializing, guests can walk up to, or swim up to, this U-shaped bar and sit on patio or in-pool stools.